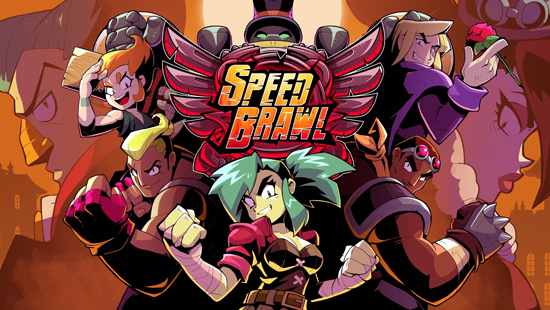 SpeedBrawl, a not so classic beat ‘em up that cranks the speed up to 11. Developed by Double Stallion Games, Speed Brawl is a 2D combat-racer with management and platforming elements. It’s about moving fast and hitting hard, maintaining momentum, and judiciously managing stamina to unleash powerful special moves! Suit up! - Devise your brawler’s optimal loadout. Buy, win, and sell equipment to fashion the ultimate fighters. Gotta go fast! - The faster you are, the harder your hit. Go for gold and blast through to the finish line. Brawl solo or brawl with a friend - Online and local co-operative play throughout! Speed Brawl is set in a dystopic Victorian era London. After a decade of war with the Lunar invaders named the Selenites, the British Empire finally vanquished the insect-like menace; following the war, the Selenites became the new workforce of our industrial revolution, ushering in a new era of progress and prosperity. However, listlessness and disobedience rampaged throughout the middle and working classes. In order to satiate the masses, the ultimate entertainment, Speed Brawl, was created; an elite sport where only the bravest, the fastest, and the most worthy warriors could wage a petty war against the Selenite hordes. To prove your worth in this chaotic world filled with colour and calamity you’ve gotta fight, for your right... to… Speed Brawl!